Tsültrim Gön met Lama Shangtönpa who became his spiritual guide and gave him the name Khyungpo Tsültrim Gönpo and granted him the empowerments of Six Yogas of Niguma, and the complete instructions for each of the Six Yoga’s and many other teachings. 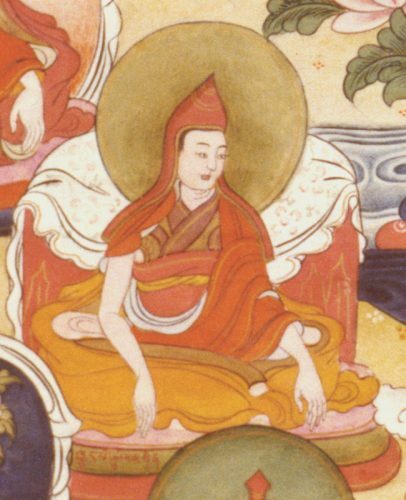 Tsültrim Gön took his monastic vows from the abbot Gendün Gyamtso of Jonang. He went to meet the lord Rangjung Dorjé, the 3rd Karmapa (1284-1339), at Tshurpu. He also met the 4th Karmapa Rölpé Dorjé (1340-1383), the incarnation of lord Rangjung Dorjé, and received empowerments and numerous teachings. Tsültrim Gön then took full ordination from Lama Shönu Jangchub. Tsültrim Gön remained in the area of Upper Shang for twenty-five years, meditating and giving instructions to the people who were suffering from diseases and demons and had many great visions of his lamas and deities. Khyungpo Tsültrim Gönpo passed away in the Tiger Year with rains of flowers and rainbows filling and illuminating space. From his cremation fire the mantra Om hrih ha ha hum hum phat could be heard. When his cremation shrine was opened, many sacred relics were discovered and distributed to his disciples. Tsültrim Gönpo, the “Second Khyungpo”, is the second of the Later Seven Jewels of the Shangpa Kagyü. Adapted from: khyung po tshul khrims mgon po’i rnam thar, shangs chos, vol. 1, p. 605-616. (translation from Tibetan by Lama Shérab Drimé).